Got Milk? : Everything You Need to Know About This Dairy Product | Grand Central Magazine | Your Campus. Your Story. It seems like everybody’s always wondering what the healthiest type of milk is and what kind of milk they should be consuming. While some people say it’s best to drink original cow’s milk, others argue that plant based milk products are more beneficial. But, do you really know the differences between the milk? It’s important to understand the processes of different types of milk before determining what kind is best for each individual. Whole milk, with its creamy and rich flavor, contains the most milk fat, totaling up to 3.5 percent. It’s important for newborns to consume this type of milk because it contains important nutrients that help develop the brain and nervous systems in the body. Now, what about the calories? What are you actually putting into your body? An 8 ounce serving of whole milk contains 150 calories, with a total fat content of eight percent and a saturated fat content of five percent. This may seem like a lot, but consuming whole milk for desired reasons such as muscle and body growth could be exactly what some people are looking for. Whole milk also contains 12 grams of sugar, but these actually come from naturally occurring lactose. So that means there’s no added sugar involved! Have you ever found yourself staring at the milk refrigerators in the grocery store, wondering what in the world the percentages on milk cartons mean? You’re not alone! Two percent and one percent milk is simply means the milk fat content has been reduced, making it better for you! Both two percent and one percent milks are strengthened with skim milk and contain 8 to 10 grams of protein. They also contain only 90 calories per serving, with no fat calories at all. If you’re looking for a way to consume your calcium and get your protein but wishing to cut back on the calories, one of these low-fat milk choices would be a better choice for you over whole milk. Lately, it seems like everyone is preaching about the benefits of almond milk and why they switched to drinking it as well. While consuming milk not from a cow might sound weird, these people aren’t crazy. Almond milk contains less calories than cow’s milk. It has a fat content of just 2.5 percent, but like nonfat milk, almond milk doesn’t contain any saturated fat. If you wanted to dive a little further into it, too, unsweetened almond milk contains half of the overall calories. While it might seem like a no brainer to convert to almond milk, you might want to think twice about what your intentions are. 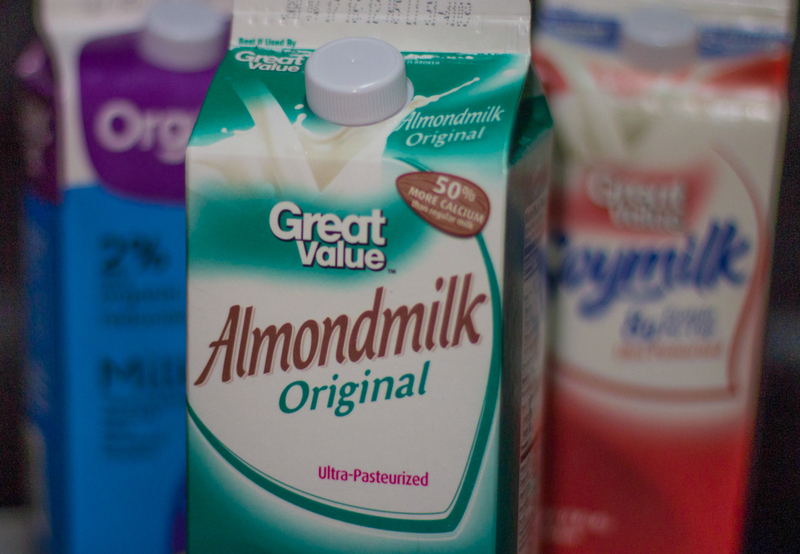 If you like the taste of milk, but are maybe trying to shed a few pounds, almond milk would be a great choice. However, it only contains one gram of protein. If your desire is to gain more muscle and make your body grow, it would be smarter to look into cow’s milk, where you’re getting more protein. Coconut milk is commonly mistaken for being “pretty much the same thing as almond milk” because it also doesn’t come from a cow, right? Wrong! Coconut milk has fewer calories than cow’s milk, but more than almond milk. Let’s take a look. In one serving of coconut milk, 70 total calories are found. 4.5 percent of those calories are fat calories, and from that, four percent come from saturated fats! While coconut milk is a good alternative if you don’t want to consume unnecessary calories, it’s good to be aware that the majority of the fat calories come from saturated fats. Now, what about on campus? Do cafeterias allow enough options to students that prefer certain dairy products over the other and adhere to individual needs? Each residential restaurant supplies certain gluten free options, but is that enough? Emily Nicholas, a CMU freshman who fulfills a gluten and milk free diet, spoke up about her thoughts. Because of the limited amount of options students with specific dietary needs have, complications can easily arise. There should be more available options, which has the potential to be considered in the future, to make CMU even that much better and personable. It breaks down to be this: all milk is essentially good for you. Whatever type you choose to drink will benefit your body in a variety of ways, giving it protein, calcium, vitamins, minerals and energy. Different types of milk are better for different reasons and ultimately, why you’re drinking the milk in the first place, but all are definitely healthy for your body. Drink up! Separator image Posted in Food & Wellness, Health, Healthy Living, Nutrition and tagged with Ally Streich, cafeteria, Food & Beverage, Healthy, healthy living, milk.